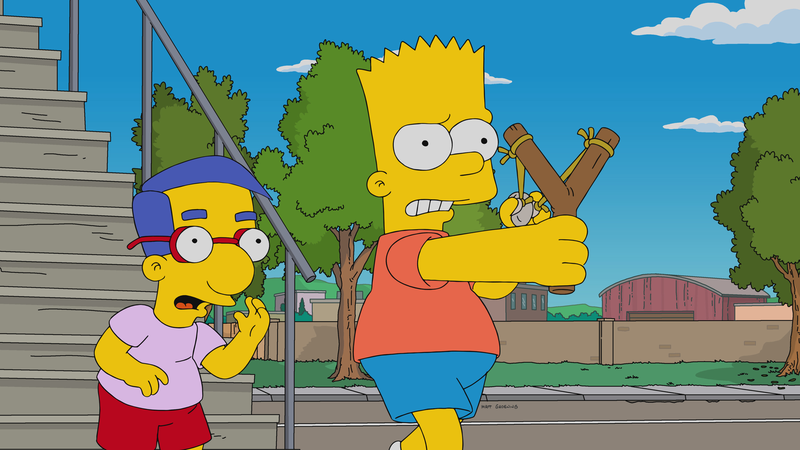 I think Bart and Milhouse are threatening people into watching. No Easter bunny hopping about for “The Simpsons”, as it narrowly avoids dipping below the two million viewers mark. Another episode, another fractional rating for “The Simpsons”, three weeks/episodes in a row this time (a new record). Sunday’s episode drew a 0.9/4 rating and 2.06 million viewers – the show’s lowest viewership yet. (The last episode had 2.147m viewers (but the same demo rating and share), to put into contrast.) Around 56% of viewers were in the key 18-49 demo; that equates to around 1.2 million viewers, and tied for the lowest skew of Fox’s night for non-repeat shows. Despite all the doom and gloom, “The Simpsons” did manage to make it out as Fox’s most-watched show of the night, although that title doesn’t look so good when you realise that the most-watched show of the night got just 2.06m viewers. “Family Guy” came in just under “The Simpsons” in viewership, and slightly over in the unrounded demo rating (or at least was in preliminary ratings); it was the only other show on Fox that night with over two million viewers. This season is currently averaging a 1.67 rating and 4.07 million viewership. N.B. A previous version of this article incorrectly included an image from, and linked to, the episode that would air the following Sunday. This has been amended.